As a former resident of Los Angeles, New York’s public transportation system feels magical at times. Trains — underground trains — that go places you actually want to go. It’s a wonderful system. And I thank my stars that I live in an age when my smartphone can tell me how to use it. Because for all its convenience, NYC’s subway system can feel a bit labyrinthine at times — particularly when there’s a planned service disruption (there’s always a planned service disruption). Thankfully I’m equipped with a well-crafted Android app called Embark NYC, which makes it easy to plot my subway route and get notified about any potential delays. Embark NYC (which was formerly called Ride NYC) was built by a company called Pandav, which is also responsible for the popular, and similarly polished app iBART. And today, the company has some big news: it’s changing its name to Embark, and it’s releasing some data that gives an idea as to just how popular it’s gotten. Namely, that it’s now plotted a total of 20 million trips since its first app launched ten months ago, and that users are plotting an additional two million trips per month. Oh, and they’re also announcing that they were a member of Y Combinator’s most recent batch of companies. And that they’re launching a new app today that caters to Boston’s subway system, the T. To date Embark has launched support for a total of twelve cities on iOS, with three available for Android (NYC, the Bay Area, and Washington DC, which are the biggest markets). You can find all of these apps on their homepage, right here. So what’s driving Embark’s success? Cofounder David Hodge says that one of the company’s biggest differentiators is its attention to detail. 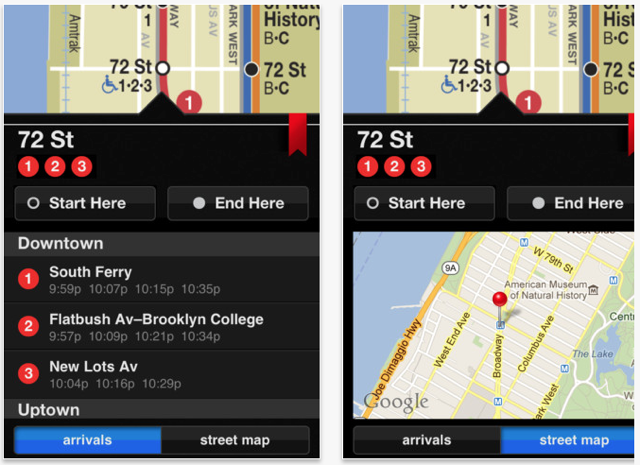 Aside from the apps’ fantastic design, the team is doing everything it can to make its recommended routes as accurate as possible — including manually timing how long it takes to make transfers at different subway stops, and even how quickly people walk in different cities (yes, New Yorkers do indeed walk faster). Other key features include the ability to use the application offline (you don’t need a data connection to plot your trip), and, starting today, the ability sign up for Push notifications that’ll let you know when there’s an issue affecting your specific subway line. There’s also a handy sharing function that will let you email, text, or (if you really want to) tweet to your itinerary. Alongside the news, Embark is sharing another key bit of information: the company is now profitable. The apps are all free — Embark is pulling this feat off through advertising alone. These ads are particularly effective, Hodge says, because users looking at the app are frequently at a so-called ‘decision point’ in terms of figuring out where they’re going and how they’re going to get there. Run a well-timed ad for Starbucks when someone is figuring out their morning commute, and they may well figure out a way to stroll past one. And with two million trips plotting per month — and growing — Embark has a lot of opportunities.